Here are some thoughts on the Gospel reading for this Sunday. I first blogged this in 2010. Mary of Bethany pours out a whole pound of expensive perfume on Jesus’ feet. This is an extravagant, seemingly wasteful and impulsive act. 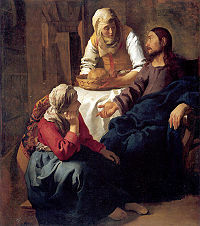 And why would she pour it on his feet and not on his head, as would have been the normal act of hospitality for anointing? Because, although you would anoint a living man on the head, this is how you would begin to prepare a corpse for burial.